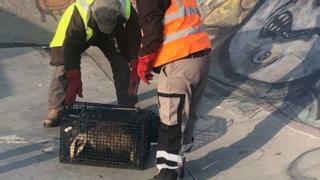 A partially-sighted badger had to be rescued after getting stuck in a skate park. The female, which was blind in one eye, had fallen into a sunken concrete bowl at Harlow Town Park in Essex and was unable to get back out. Luckily, council cleaners who arrived to spruce up the area found the "distressed" animal, which they said had cut its chin trying to escape. A badger rescue group took her to a vet and she was released the next day. "It was curled up, asleep and exhausted when I was called," Derek Barry, from Harlow Badger Group, said. He thinks the two-year-old creature had spent all night trying to escape from the 7ft-deep (2m) bowl, before help arrived on Saturday. "Badgers' eyesight is not that good at the best of times and this one had a cataract in one eye," he said. "It was really lucky the council workers arrived." Using a blanket they managed to get the badger into a cage and it was taken to a wildlife hospital and given the all-clear by a vet. Mr Barry said he took the animal home and monitored it overnight during which time it "took several naps" in between eating snacks. The omnivore was safely released near the area it was found on Sunday night.